The Malta FA’s on-going efforts to upgrade the clubs’ facilities received a boost yesterday in the shape of a €3 million grant from the government. Titled ‘Co-operation between the MFA and the government on infrastructural projects’, the agreement, covering a four-year period, was signed by Norman Darmanin Demajo, the president of the Malta FA, and Stefan Buontempo, the Parliamentary Secretary for Youth and Sport. A visibly delighted Darmanin Demajo said the funding will enable the association to complete the remaining infrastructural projects submitted by 10 clubs. As the estimated cost of the whole investment is €6 million, the Malta FA will provide the remaining €3 million from its coffers. Addressing a news conference, Darmanin Demajo said the agreement with the government follows lengthy discussions about the present and future needs of Maltese football. “Over the past few months, the Malta FA has been engaged in discussions with the government, represented by the Parliamentary Secretary Stefan Buontempo, about the needs of Maltese football in the coming months and years,” he said. “This is not a one-off agreement but should be viewed as part of a broader picture. “With the introduction of the Financial Fair Play rules, more people will be encouraged to invest in football. “In the last three years, I have had the opportunity to meet several investors who are showing interest and prepared to fork out money to improve facilities and raise standards. “This is what happened in Cyprus a few years back. 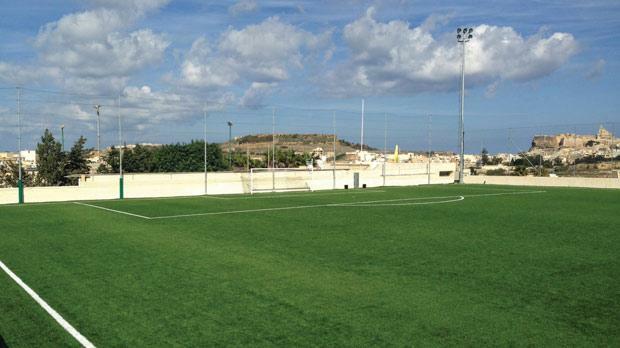 Over the past three years, the Malta FA has undertaken a massive drive to upgrade club facilities. “In order to complete the pending projects, we need more money so we have taken out bank loans but we were still short of the required amount. In asking for the government’s assistance, we also told the authorities to recognise that football today is also an economic activity. “From our side, we have promised to get our house in order, especially as far as the clubs’ accounts are concerned, following the introduction of a special income tax rate of 7.5 per cent for players. Darmanin Demajo said the focus of the discussions between the MFA and the government will now shift to the lease agreements on the sites that were passed on to the clubs in the past. “We are discussing the possibility of reviewing the lease agreements to enable the tenants, namely the clubs, to turn into a public limited company and run these sites on a commercial basis,” Darmanin Demajo pointed out. Praising the Malta FA for their work and the seriousness of their approach, Dr Buontempo urged other associations to follow suit. “I want to make it clear that one of the organisations I’ve enjoyed working with over the past eight months is the MFA,” he said. “I appeal to other associations to follow their lead. “The beneficiaries of this agreement are not the MFA but the ones coming up. The Parliamentary Secretary for sport expressed his willingness to collaborate with the Malta FA in reviewing the terms of the lease agreements. “In the next year, one of our main challenges is the lease agreements,” Dr Buontempo said. “In the last 15 days, we have fulfilled a number of electoral promises with the signing of an agreement with the MOC, the extension of the 20/20 leave scheme for elite athletes and the allocation of these funds to embellish the footballing infrastructure. The injection of €6 million into infrastructural projects will bring up the Malta FA and government’s investment to a total of €28m. Dr Buontempo also referred to the additional spin-offs football will have on the country’s economy when the Malta FA host the Under-17 European Champion-ships in May. “The UEFA Under-17 tournament will not only benefit the youngsters taking part, it will also help the economy as many players, coaches, officials and supporters will travel to our country,” Dr Buontempo said. Darmanin Demajo explained that UEFA allocate a budget for the organisation of the Under-17 tournament but that doesn’t cover the embellishment of the stadiums in the host country. The MFA are seeking a number of sponsors for the Under-17 Championship finals, the last to feature eight teams. Darmanin Demajo said he was looking forward to watching the Malta U-17 team test their wits against their Italian counterparts in a friendly match at Catania’s Torre del Grifo complex tomorrow as part of their build-up for next year’s European tournament.